Physicists have simulated the structure of a new material based on fullerite and single crystal diamond to show how this material can obtain ultrahigh hardness. This discovery offers potential conditions for obtaining ultrahard materials. The results were published in Carbon. Fullerite is a molecular crystal with fullerene molecules at its lattice nodes. Fullerene is a spherical molecule of carbon atoms. It was first synthesized over 30 years ago, and its discovery was awarded with the Nobel Prize. Carbon spheres in fullerite may be packed in different ways, and the hardness of the material strongly depends on how the fullerenes are connected to each other. A team of Russian scientists has now explained why fullerite becomes an ultra-hard material. Alexander Kvashnin, Candidate of Physics and Mathematics, the main author, said, "When we started to discuss this idea, I was working at TISNCM. 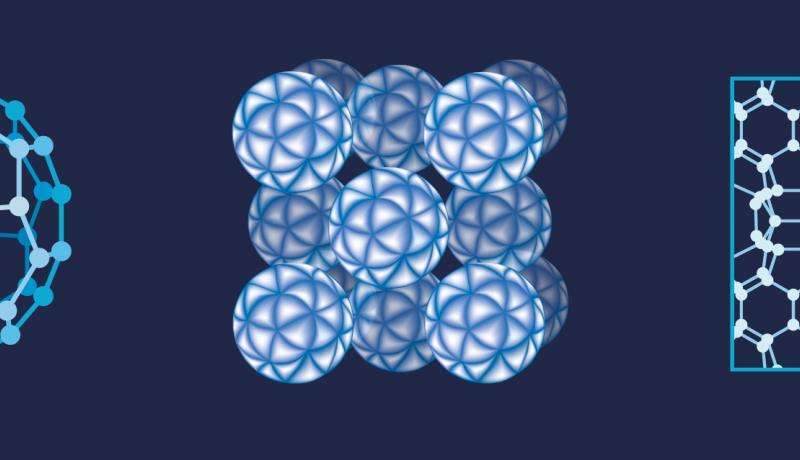 There, in 1998, a group of scientists headed by Vladimir D. Blank obtained a new material based on fullerenes—ultrahard fullerite, or 'tisnumit.' According to the measurements, this new material could scratch diamond—it was, in fact, harder than diamond." The substance was not single-crystal material; it contained amorphous carbon and 3-D-polymerized molecules of C60. Still, its crystal structure is not yet completely understood. The fullerene molecule has excellent mechanical rigidity. At the same time, the fullerite crystal is a soft material under normal conditions, but becomes harder than diamond under pressure (due to the 3-D polymerization). Although this material has been synthesized and studied for more than 20 years now, the reason why it becomes ultrahard is still unknown. There is a number of models that have been developed to explain how fullerenes can be polymerized into fullerite. One of the models was proposed by Prof. Leonid A. Chernozatonskii. The X-ray diffraction pattern of the model perfectly agrees with experimental data, and should have a high volumetric bulk modulus, several times higher than the diamond value. But the relaxed structure of the model does not display such fascinating properties. Alexander Kvashnin said, "We based our analysis on that model and the experimentally known fact that if you apply more than 10 GPa pressure to fullerene powder and heat it above 1800 K, you obtain a polycrystalline diamond. The idea was to combine these two facts. On the one hand, a super-hard fullerite material, and on the other hand, under pressure, fullerenes turn into a polycrystalline diamond." The scientists suggested that under pressure, part of the fullerite turned into diamond, while the other part remained as fullerite in a compressed state within the diamond. To simplify the model, the fullerite crystal structure proposed by Prof. Chernozatonskii was placed inside a single crystal diamond. The researchers then studied this composite material. The idea was that fullerite inside diamond should be compressed. It is known that in the compressed state, the elastic and mechanical properties of the material increase. And diamond would act as a shell, keeping the compressed fullerite inside to preserve all those properties. In the study, they first analysed small models containing 2.5 nm fullerite grain inside the 1 nm thick diamond shell. However, such a small model did not comply with the experimental data. Then the researchers started modelling the composites, where the size of fullerite was increased up to 15.8 nm, and the thickness of diamond shell remained the same. The changes in the X-ray diffraction spectrum showed that the increase in the fullerite size brought the spectrum closer to the experimental data. After comparing the spectra, it was assumed that most likely in the experiment, they had obtained an amorphous carbon medium with a hydrostatically compressed fullerite inside, while the model dealt with a diamond with fullerite inside. According to the calculated spectrum, the new model correlated very well with the experimental data. "The developed model will help us to understand the nature of its unique properties and to systematically synthesize the new ultra-hard carbon materials, as well as to contribute to the further development of this promising field of science," said Pavel Sorokin, head of the project (TISNCM, MISIS, MIPT). Fullerite itself is not very hard; its bulk modulus is 1.5 times less than that of diamond. But when it's compressed, its bulk modulus increases dramatically. To preserve this enhanced bulk modulus, the fullerite should always remain in such a compressed state. 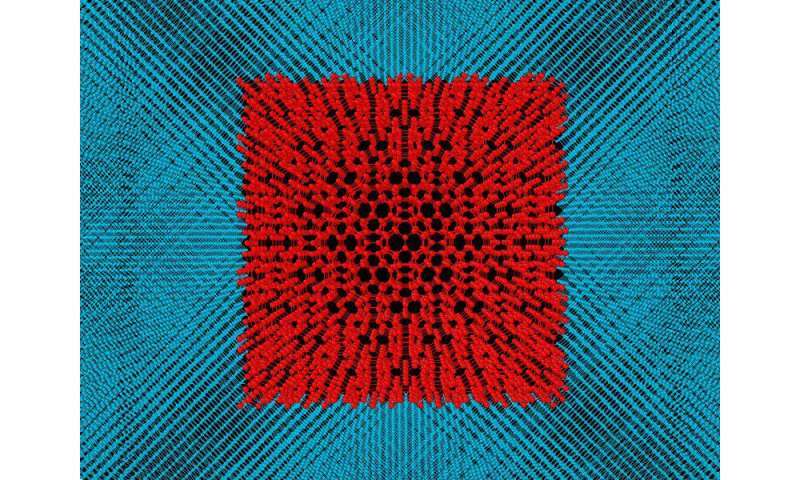 Using the results of simulations, the scientists can conduct targeted experiments to obtain an ultra-hard material.